Signed note by Jawaharlal Nehru in both Sanskrit and English dated Nov. 1961. 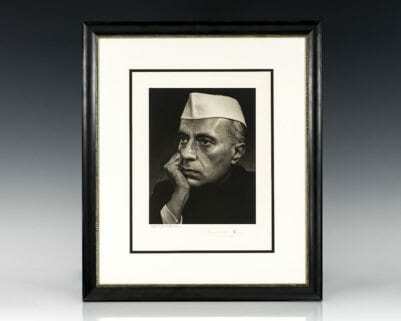 Matted and framed with a black and white photograph of Nehru. The entire piece measures 13.5 inches by 17.5 inches. Jawaharlal Nehru was the first Prime Minister of India and a central figure in Indian politics before and after independence. He emerged as the paramount leader of the Indian independence movement under the tutelage of Mahatma Gandhi and ruled India from its establishment as an independent nation in 1947 until his death in 1964. He is considered to be the architect of the modern Indian nation-state: a sovereign, socialist, secular, and democratic republic. 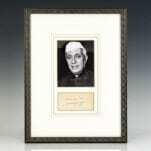 Signed note by the first prime minister of India, “All good wishes Jawaharlal Nehru Nov. 5, 1937.” Double matted and framed with a black and white photograph of Nehru. The entire piece measures 18 inches by 13 inches. First edition of this collection of essays and statements by Nehru. Octavo, original cloth. Presentation copy, inscribed by the author on the half-title page in the year of publication, “To Bee, Jawaharlal Nehru Hamirpur Feb. 1938.” In near fine condition. 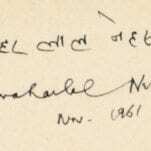 Books signed and inscribed by Nehru are rare. New York: The John Day Company, 1946. First edition one of the finest modern works on Indian history. Octavo, original cloth. Signed and dated by the author on the front free endpaper, “Jawaharlal Nehru Oct. 1949.” Near fine in a very good dust jacket with a chip to the spine. Rare and desirable signed. Glimpses of World History: Two Volume Set. Allahabad: Printed by M.N. Pandey , 1934-35. First editions of “one of the most remarkable books ever written” (The New York Times). Octavo, 2 volumes, original cloth. In very good condition. Foreword by Vijaya Lakshmi Pandit. First editions are exceptionally rare. Jawaharlal Nehru and Yousuf Karsh Signed Photograph. Black and white photograph of the first prime minister of India Jawaharlal Nehru. 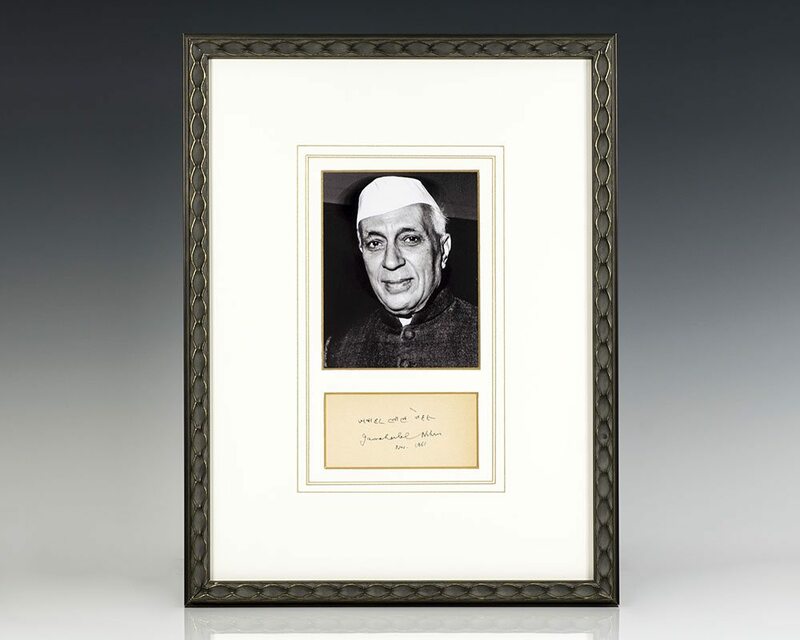 Signed Jawaharlal Nehru March 1951 and also signed by the photographer Yousuf Karsh. Karsh was one of the most notable photographers of the 20th century. His work included portraits of celebrities, military and political figures, such as Winston Churchill, Dwight D. Eisenhower, Martin Luther King, Audrey Hepburn, and many others. The photograph measures 10 inches by 12.75 inches. Double matted and framed. The entire piece measures 17 inches by 19.5 inches. Rare and desirable signed by both Nehru and Karsh.